Our bad habits happen due to impaired planets. When this planet remains weak for long time then this habits remain for long time. If we send some special waves in our body through special gemstone then one can get rid of from habits. 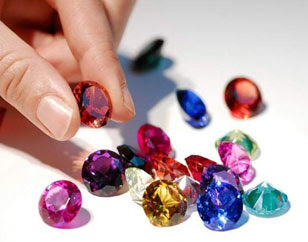 Some special gemstone gives good results if one also takes some efforts. Addiction: Rahu and Shani play an important role in addiction. It is beneficial to wear gemstone which balances both the planets. Melakite is very effective to avoid addiction. It is the white color gemstone, which has white strips. Wear it in silver ring in left hand’s little finger on Wednesday morning. Anger: Inauspicious planets affect speech and nature. However, Jupiter gives patience and good speech. One can avoid harsh speech and anger by strengthening Jupiter. One can wear Sunhala to control anger and good speech. It is the yellow color transparent stone. Wear it in gold or brass in right hand’s index finger on Thursday morning. Laziness: One has low energy when Mars or Sun is weak. A person becomes careless and lazy. One can get rid of from this habit by strengthening fire element in the body. One can wear Garnet. Wear it in gold or copper ring in right hand’s ring finger on Sunday morning. Falsehood: Many planets are responsible for falsehood and wrong company. However, weak Moon and Shani are responsible for it. One can wear Sodalite. It is the blue color stone and has white strips. Wear it in silver ring in left hand’s middle finger on Saturday night. Good Luck: Visit to Hanuman temple on Saturday. Stand in front of him and chant Hanuman Chalisa. This is beneficial to get rid of Shani related health issues.